How Much Does Home Decoration for Christmas Cost? Christmas is a festive time when you can feel the celebratory mood in the air. During this time, everyone wants to celebrate and have a great time with their loved ones. People make it a point to go shopping and purchase all sorts of great stuff for the occasion. However, it is not just about dressing up or preparing a Christmas meal that is the focus at this time. People also look to ensure that they decorate their house in the most beautiful manner. It is quite common for people to look for a rough estimate as to how much the decoration would cost so that they can prepare their budget accordingly. This is what we are going to discuss now. The first part of Christmas decoration is purchasing a tree. This depends on your preference. You can find Christmas trees for $50 to $300. The type of tree you want, its size, and the place you get it from would influence the tree you get your hands on. Plenty of options and variations are available, so this is not something that you would have to be worried about. The next integral part of home decorations is lighting. If we talk about outdoor Christmas lighting, on average, this can cost you around $1,000 to $1,500. If this is the amount you set aside for the purpose of lighting, you would be able to acquire simple yet elegant lighting for Christmas celebrations. However, if you are looking for really lavish decoration, you can also get lighting worth over $3,000. It is seen that on average, home decoration installation tends to cost around $2,500. However, this varies from person to person since people even spend as much as $10,000 for home decoration when they are looking to go all out and create an impact. Some people also prefer to have lighting for their outdoor trees since it adds beauty, elegance, and drama to the decorations. This is quite a bit of work and tends to take long hours. Also, this is something that would cost you a significant amount of money. Decorations do not end at lightings. People also look for other special touches such as inflatable snow globes, miniatures of Santa with reindeer, and much more. All this can cost $1,000 or more. If you have some extra budget, you can ensure that the outdoor area looks every bit as perfect for Christmas as possible. Ornaments, Christmas tree toppers, candles and garlands are common indoor decorations. These things ensure that your guests are impressed with the amount of effort you have put in and all this can collectively cost you another $1,000. The prices that are mentioned are in line with those who simply make the purchases and do the work on their own. If you decide to hire professional decorators for the purpose, the amount that you would be required to pay would increase significantly, so this is something that you would need to decide. Should the average working Joe decorate his house? 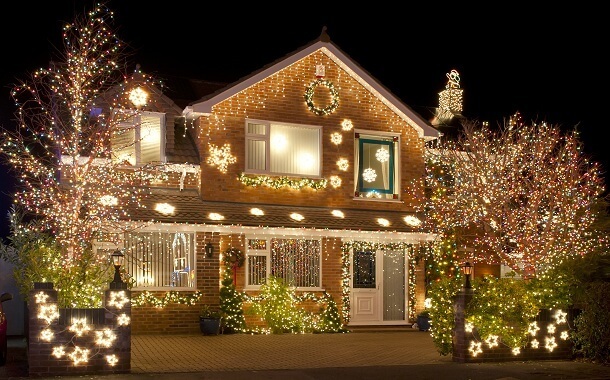 If you want to decorate your home for Christmas, the first thing that you should do is make a realistic budget. You can then determine the extent that you want to go to for the decorations, depending on the budget that you have. It is not necessary to be extravagant in this regard. Sometimes, the simplest decorations make the most impact, so do not let the matter of home decorations put a dent on your spirits. Enjoy Christmas with your loved ones without putting a strain on your budget. If you think lighting costs a lot, you can let candles do the job. If a huge tree is out of budget for you, you can opt for a smaller one. You will not face any dearth of options. A great tip is to start the decorations from the inside, as those are the ones you will most likely see the most during Christmas. The only thing that is required of you is to conduct an adequate amount of research so that you get things at the best prices. This would guarantee that you do not have to compromise on the Christmas spirit due to financial constraints. https://www.thepricer.org/wp-content/uploads/2016/12/the-price-of-home-decoration-for-christmas.jpg 380 610 qSign http://www.thepricer.org/wp-content/uploads/2016/11/pricerlogonew.png qSign2016-12-27 00:56:042016-12-27 00:56:18How Much Does Home Decoration for Christmas Cost? How Much Does a Pet Fish Cost? How Much Does a New Year’s Vacation in Las Vegas, Nevada Cost?